Oracle users often state their top priority is reliability, followed by a blend of performance, capacity, and cost. These requirements provide the framework for this paper. To reduce costs and achieve a rapid return on investment, enterprises can run large performance-sensitive Oracle databases with confidence, or consolidate databases from many servers. Leveraging flash storage allows I/O requests to complete quicker by an order of magnitude over traditional spindle hard drive storage. 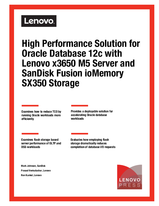 This paper provides a set of deployable solutions for accelerating various Oracle Database workloads with SanDisk PCIe based flash storage while simultaneously reducing TCO. Two database workloads are examined in this paper: On-Line Transaction Processing (OLTP), and Decision Support System (DSS). As shown in this paper, using SanDisk PCIe based flash storage all but eliminates the processor’s spin-wait events and allows the system as a whole to perform significantly more operations per unit of time.